A unique and creepy thriller that is entertaining for the first three quarters, but then runs out of creative energy in the final act. The Vanishing is a very strange and very creative movie. It’s about a kidnapping, but it’s told in such a way that for most of the movie you are not sure of exactly what happened. That mystery angle is what essentially keeps us on the edge of our seat, wanting to know more. And yet the movie supplies us with enough clues and ideas to put together a basic scenario of what might have happened. It’s filling in the missing pieces that become the fun of the film. One thing that makes the movie very strange, but also unique is that the first ten minutes or so are spent only with the bad guy. He’s not the star of the movie at all, but the movie wants us to know what sorts of crazy things might lie ahead of us, and so it opens with this villain, Barney (played by Jeff bridges), practicing his methods for kidnapping. First he drugs himself with a soaked piece of cloth that he presses against his nose and times himself to see how long he stays unconscious for. He keeps a log of this data. After that, we watch from a bird’s eye view angle as he practices what he will say to unsuspecting women to try to get them into his car. We meet his daughter and spend a little time with her as Barney preaches to her about the importance of secrecy when it comes to romance. This will all come up later in the plot, and so the scenes are serving as both introductions to Barney and his family, as well as some foreshadowing of what’s to come. And after we meet the daughter, we are back on the road again with Barney, this time watching him attempt to put his routine into practice. He tries asking where the post office is, offering women a ride in the direction they are going, and doing anything else he can think of to get them into his car. Nothing works. And now it’s time to meet our hero. It’s a long introduction to get here, but a worthy one. Our hero is Jeff, played by Kiefer Sutherland. 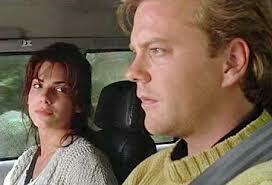 He’s driving around the mount St. Helens area with girlfriend Diane (Sandra Bullock.) the two of them are having a mini-argument when they get a flat tire. They leave the car in a tunnel, only she stays with it and he leaves. When he gets back, she’s not there. This is meant to be a false scare. He finds her soon after, but of course the scene is setting up things that are to come. And then we get the disappearance scene at a gas station rest stop. She goes in to get drinks and use the bathroom and he stays by his car, lying on the hood an then getting up to play some hack I sack. If this movie was made today, he would be sitting in the car talking to someone on his cell phone. He does this for a while, until it seems like she has been gone for too long, and then he goes searching for her. Only she’s gone. The rest of the movie becomes about Jeff’s search for Diane. We don’t know what exactly Barney did with her or why, but like Jeff, we want desperately to find out. The movie quickly jumps to three years later, and Jeff is still out on the road, putting up missing person flyers and searching for her. Barney, meanwhile, wants to let the events go, but can’t because every month there is another flyer up reminding him of what he has done. Jeff meets a bartender named Rita (Nancy Travis) one night and she sees that he is beaten down and in some serious need of sleep. She sets him up on a cot in the back, and the next thing you know they are moving in together. All of this is pretty rushed, but there’s a reason for that. The movie isn’t about Jeff’s relationship with Rita. It’s about his search for Diane. In order to devote most of it’s time to this search, the Jeff and Rita relationship needs to take a back seat. And so it does. Most of the movie is about Jeff continuing his search. Rita tries to get Jeff to put it behind him, but other things keep getting in the way of him letting it go. For one, the book publisher Jeff works with wants him to write his story about losing Diane as a novel. Jeff needs the job (his publisher isn’t accepting the other book he wrote), but part of him probably just wants to write it all anyway. To kind of experience it again and also to dig deeper into what actually happened. The final part of the movie is about Barney and Jeff finally confronting each other, and luckily the first part of this final act does start to supply us with some answers. There’s no logical reason for why Barney did what he did, but at least we get to here his reasoning behind it, and understand how a crazy person might make sense of it. And then we get the action cliMax in the cabin in the woods. That final climax gets a little silly at time. I mean, there’s only so many times a different character can be told to drink the coffee cup before it becomes ridiculous. And once the questions about what happened are all answered, we start to lose interest. We don’t really care about Jeff and Rita; we cared about finding out what happened to Diane. The movie makes the mistake of revealing that too soon and then expecting us to care about what happens to Jeff and Rita for the remainder of the film. 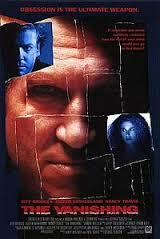 Most of this movie was pretty solid and intriguing, but it definitely lost its focus at the end. Even the final showdown between good guy and bad guy is cut too quickly and not made clear enough. Most of this movie worked fabulously, but the ending was certainly lacking.